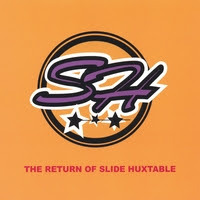 Kelly Rossum's current favorite CD: The Return of Slide Huxtable. Named for the episode of The Cosby Show in which character Cliff's dad Russell plays at a jam session (with the real Slide Hampton performing off camera), the quartet includes trombonist Mark Miller of the Motion Poets, guitarist Bill Bergmann, and the fabulous Bates brothers, Chris and J.T. With Dean Magraw stepping in for Bergmann, they are performing in three local clubs this week: the Clown Lodge (a.k.a. Clown Lounge, a.k.a. the basement of the Turf Club) on Monday, the Artists' Quarter on Thursday, and the Dakota on Friday (the late-night show). If ever a club needed to update its Web site, it's the Clown Lounge/Lodge/whatever. (Clown Luge?) I checked and the last calendar update was 3/2/05. Read a preview on Jazz Police. Hear Slide Huxtable on MySpace.